Some people say cats are like chips — you can’t have just one! As one of the 85 million1 cat owners out there, you may be considering adding a new feline friend to your home. Whether your current cat is lonely, her companion cat recently passed away or you simply love cats, it is important to take a few precautions to ensure that your cat-to-cat introductions go as smoothly as possible. American Humane strongly recommends adopting a cat from a local animal shelter. Millions of wonderful cats enter animal shelters each year, but tragically, 71 percent are euthanized because there are simply not enough homes for them.2 A wide variety of cat breeds, sizes, colors and personalities can be found at any animal shelter, which gives you a lot of options to choose from. Most shelters also have information about each cat’s personality and background, which increases your chances of success. We recommend not purchasing from pet stores, as the cats there are no “better” than the homeless animals you’ll find at your local shelter, and they may have come from purebred parents who are kept in inappropriate conditions or not have been given the same amount of veterinary care as shelter cats. If you are committed to finding a specific breed of cat, be sure to find a reputable breeder to deal with. If you have your heart set on a kitten, wait it out until “kitten season” — shelters are often inundated with homeless kittens in the springtime. But remember, in just a few short months that adorable kitten will look just like an adult. Additionally, keep in mind that by adopting an adult cat, you will be able to assess more about his or her fundamental personality than you will be able to for a kitten, which could improve your chances of success. If you have a very laid-back, elderly or frail kitty at home, it is best to avoid kittens and very playful or rambunctious cats. If you have a rambunctious cat who zooms all over the house, getting a very laid-back or quiet, shy cat is probably not wise. Try to focus on cats who have personalities similar to that of your current cat. Once you have selected a potential new cat, ask the shelter or breeder if you can take home a blanket the cat has slept on to give to your resident kitty. Also ask if it would be possible to bring a blanket from home that your resident kitty has slept on, to give to your new cat. In some cases, this will not be possible — especially with kittens — due to disease concerns. But if you can exchange the cats’ scents with one another, you will be introducing a very important identification and communication signal right off the bat. Find a quiet room in your house (a bedroom or bathroom) where you can keep her safely separated from the resident cat for a few days. Make sure it is a room where the resident cat has been, that it can be easily accessed by all human family members for social interactions and playtime, and that it is set up with food, water, litter, toys and soft beds. Choose a room that has an inch or two of space under the door for feline introductions. Place both cats’ dishes close to the door, on their respective sides. If one of the cats refuses to eat, you can feed her elsewhere, but still place dishes of tuna or some other tasty snack on either side of the door. 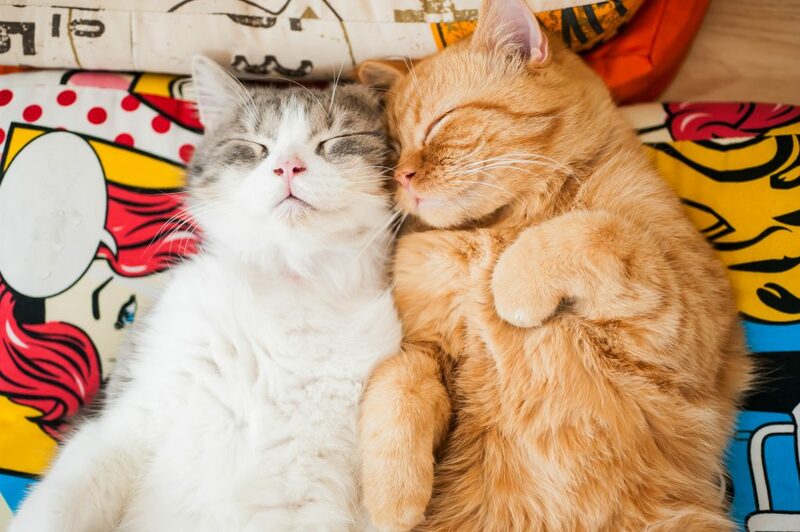 By having both cats experience something positive (a meal or yummy snack) while they are nearby, they can learn to form positive associations with each other. If either cat is growling or hissing at the other through the door, donot put them together anytime soon; take things very slowly and continue feeding this way. If the problems continue for several days, it is likely the match is not going to work out. The resident cat should now be confined in the room, while the new cat is allowed to roam the house. Each cat should use the other cat’s (scooped!) litter box, food and water dishes, beds and toys, so the only thing being exchanged is the cats themselves. Continue to feed both cats close to their respective sides of the door. While the new cat is exploring your home, you may want to close bedroom and bathroom doors at first so she does not feel overwhelmed. Over the course of a few days, open a door or two at a time and increase the amount of space the new cat has access to. The new cat spends a few days in the room, then a few in the house, then back in the room — while the resident cat is in the opposite location. This can help ensure lots of scent exchange and desensitization. Continue feeding both cats on their respective sides of the door, and continue switching them back and forth. If everything seems fine, and everyone is acting, eating and using the litter box normally, then it’s time to take down the gates. There may be some hissing or swatting, but cats often will work things out by themselves. If there is a fight in which one of the cats is traumatized or injured (and you have followed all of the above steps), then the match will likely not work out. If the cats seem to tolerate, ignore, enjoy or interact with each other – that’s great news! It’s a good idea to separate the cats at first when you will not be around to supervise them. You want to ensure that you see all their interactions and know exactly what is going on. After you feel that the cats are getting along, you can ease up on this step. Getting another cat will have a big impact on your resident cat, so considering your decision carefully and introducing them properly is the right thing to do. Good luck!